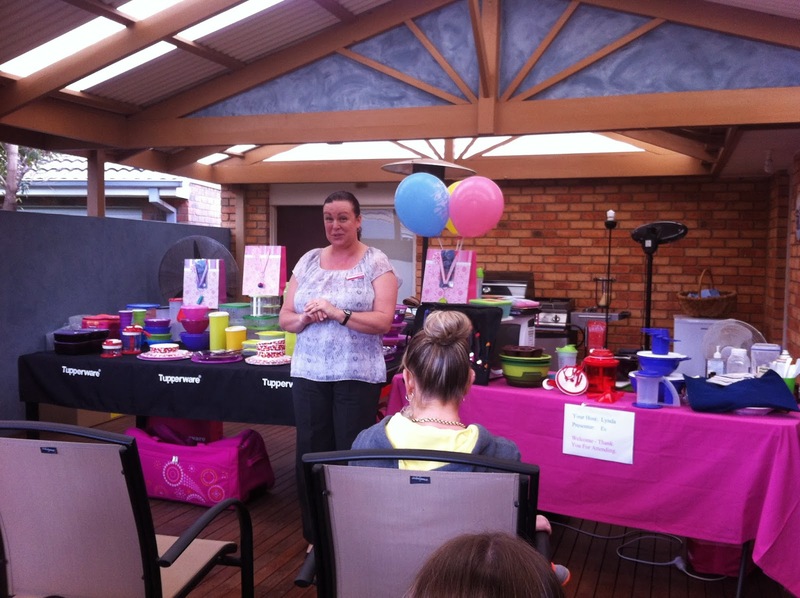 Do you remember a few weeks ago i did a post of the dangers of attending a Tupperware party (here)? Well today i had my own. I know, I know, i can hear you all scoffing from here. My bestie needed a booking to get to a certain level to qualify for free stuff. Its been a little while since I've had a gathering at home and well, any excuse for a party i say. No sales objectives and therefore no pressure to buy anything or coerce my guests to do the same. Es is the ants pants of presenters. She is friendly, engaging, knows her product well and i think she could sell ice to the Eskimos. 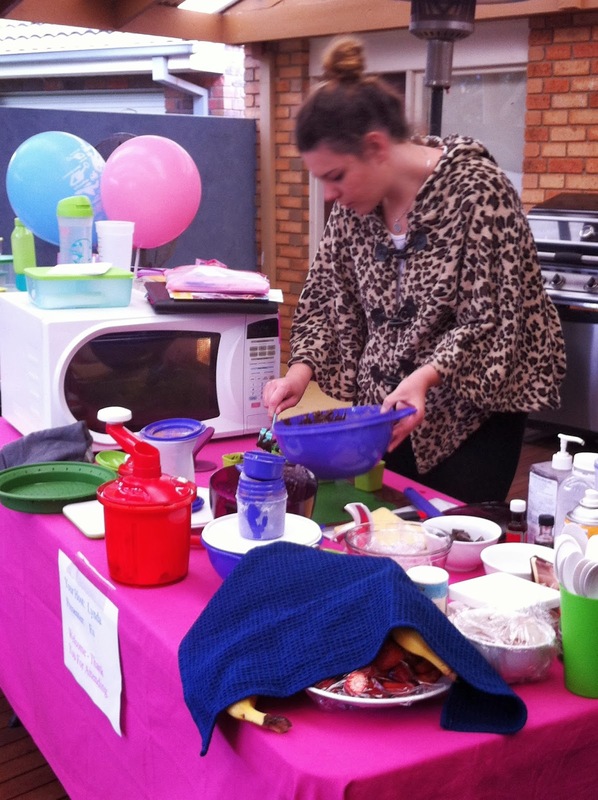 She does it though by thoroughly demonstrating the product and not being pushy salesperson. She would make a great trainer for new reps.
Now you know my motto, if you are going to do something then do it well. Look at all these people. There were some not in the photo so 18 in total. There were neighbours that i know and some that i don't plus friends i hadn't seen for a while. 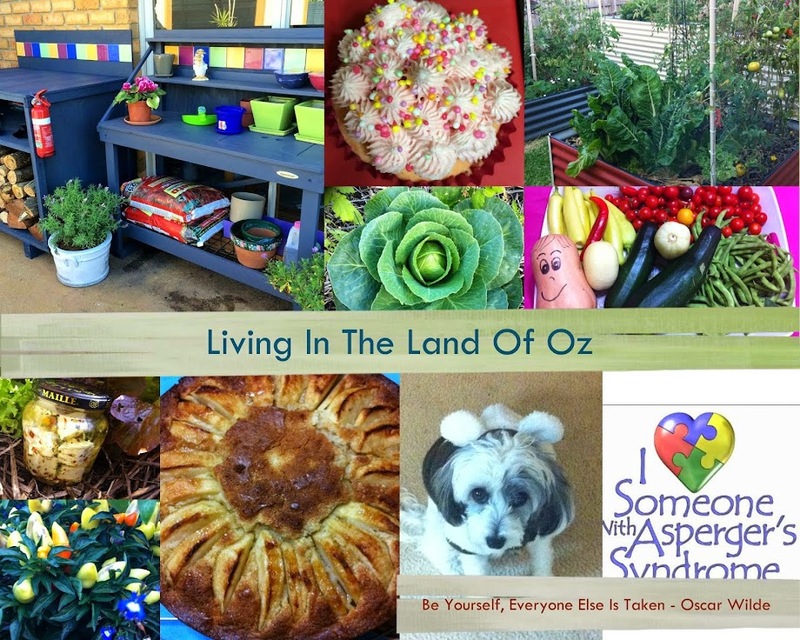 My Mum and brother from NSW are visiting, my sister Glenda of course and my Bestie with Mirandah. Veronica came from work (first visit to my home and garden), Noelle, her friend and granddaughter, but a special treat was a special bloggy friend and her children. Today i met Miss Townmouse, Sharon from Ballarat, and her beautiful daughter India and her son, Tyler. What a nice family and so good of her to travel so far. Miss Mirandah being a willing assistant to Es, folding the melted Toblerone into whipped cream for a dip. Did i say "melted Toblerone"? 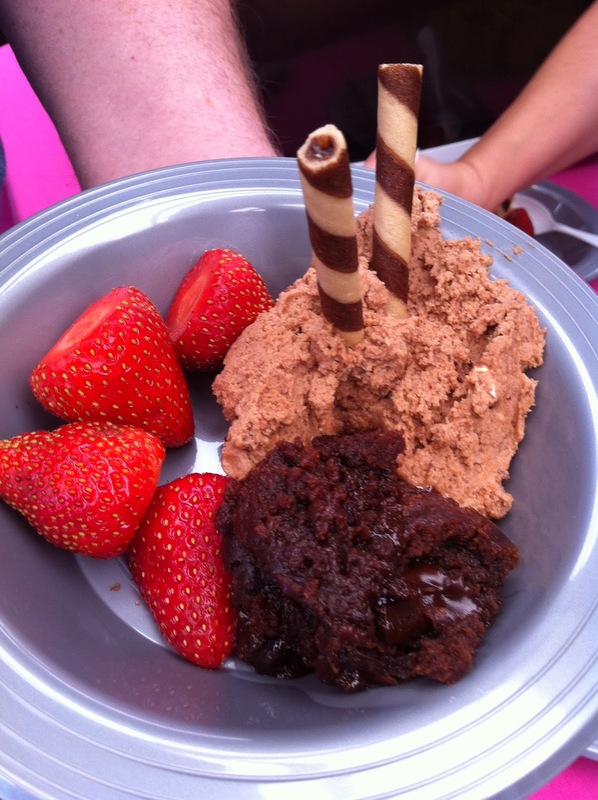 Yep, my theme was chocolate and so we made, using Tupperware and a microwave, Toblerone Dip (which takes minutes) and Chocolate Lava Muffins. 200gm of Toblerone, melted at 50% power for a couple of minutes (keep checking). 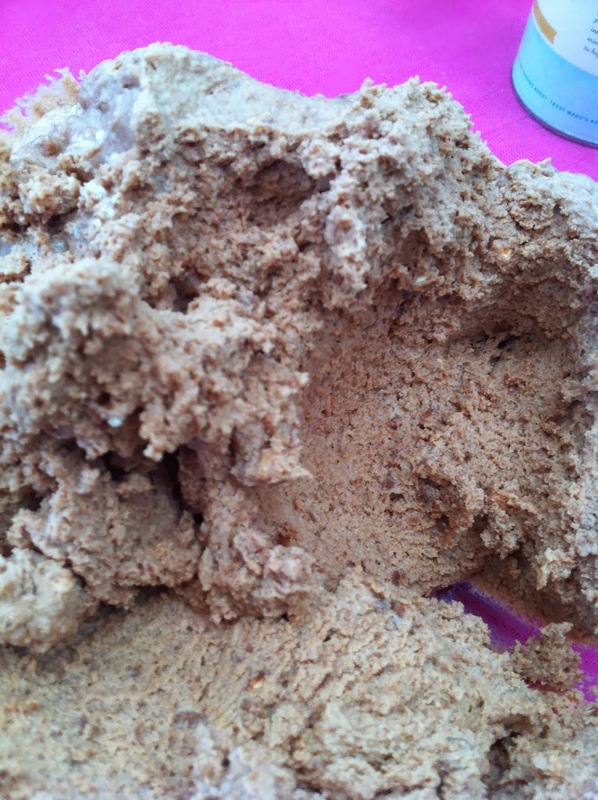 It keeps its shape so take it out and give it a swirl with a spatula and then in for another quick go. 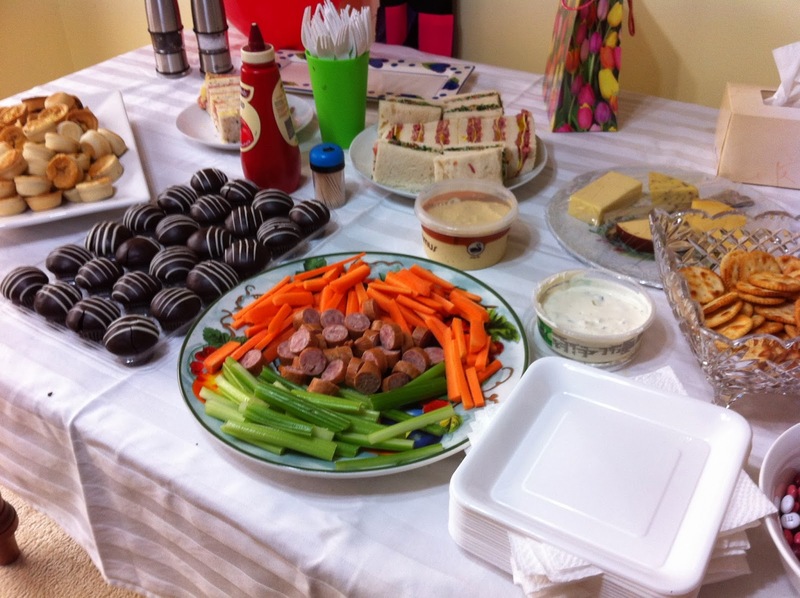 Just simple spread of the normal stuff - I didn't have time for a home baking session. I have no idea what i will choose for my discounted purchases. My Mum wanted a new beetroot holder and so i may get this set and pass it along. I know i reached the first level of $500 sales and so i am able to purchase this entire set for $30. That's a $120 saving. I wanted the Vent Smart Small High for keeping broccoli in the fridge (it is a heavy breather and so i would have the vent all the way open) and the Deli Keepers wont go astray for keeping cold meats in. I can use the round bowls for salads to go to work in my new thermo bag below. 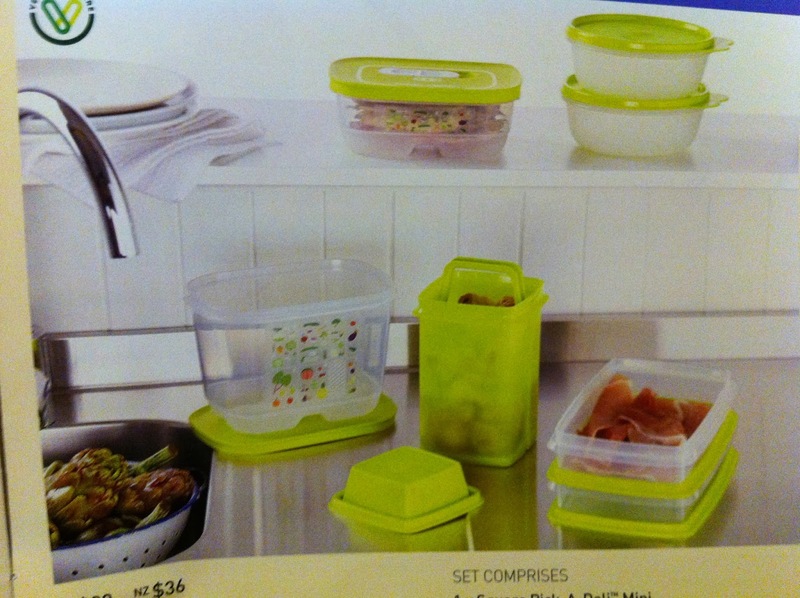 I know Hubby, who loved his first ever Tupperware party, is keen for me to get a couple of Veg Outs. These are for veggies that live out of the fridge like potatoes and onions. They have a vented lit and an easy open mouth for access. 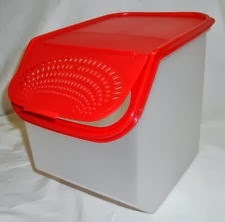 Es uses one of these for her snack box. We had a stink in the pantry this week that was so off. I was getting ready to empty the whole thing (its a walk in so big job) thinking it were mice when he discovered it was rotting potatoes in the bottom of the plastic waste paper bin we use for storing both onions and potatoes together. Bit of a mess really and not at all functional. So if i can manage both these items that includes getting Mum her item then ill be satisfied. So what did we do for the rest of the day, when the crowd made their way home. Some of my guests went onto the next party at Ella's, for cocktails and mocktails. I'm looking forward to getting the recipes. Do you remember when Miss Townmouse did her training in Indian Head Massages. Well if you don't, then shame on you. Pop over and have a look at all the benefits. Indian Head Massage While you are visiting, click on the follow tab because Sharon is an awesome cook, has the best garden and the cutest animals for pets. Lucky me and Hubby were both treated to the most relaxing massage. The aromatherapy oils still linger in the house and through my hair. My pillows are going to smell great. Its a very gentle massage so dont be thinking its going to leave you sore the next day. Its done in a chair with your shoulders bare and incorporates elements of Reiki as well. 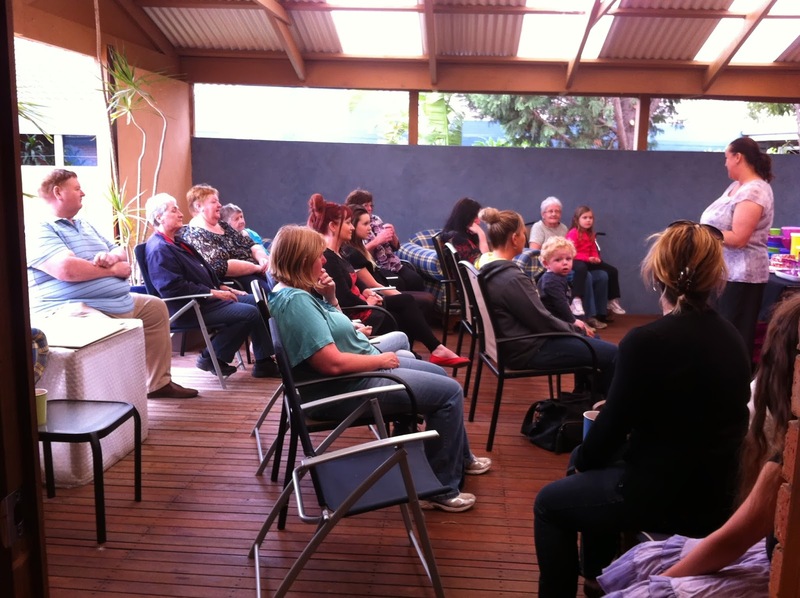 Great job Sharon and I'm looking forward to you completing your reflexology course shortly. She wouldnt let me pay and so I'm going to have to think up some special treat for her. Little Miss Tilly had a good day getting lots of cuddles and sympathy. 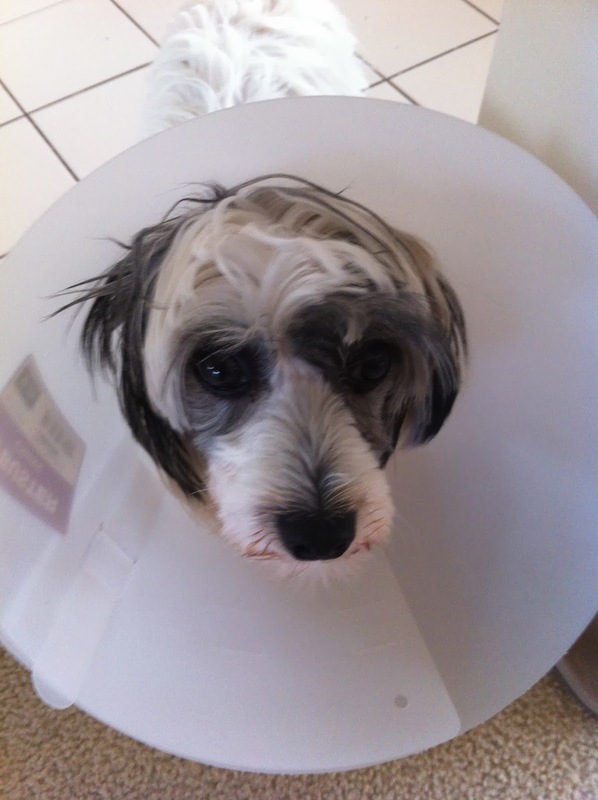 She was desexed last week and is now currently known as Miss Buckethead. For the first couple of days she was so confused and i felt so guilty trying to explain to her what we had done. Oh Mum, what did you do to me. Ive got a tummy full of stitches and this bloody thing around my head that wont let me play properly and its annoying trying to sleep with it. I know Tilly, its annoying for me to get hit in the face with a bucket in the middle of the night as well! 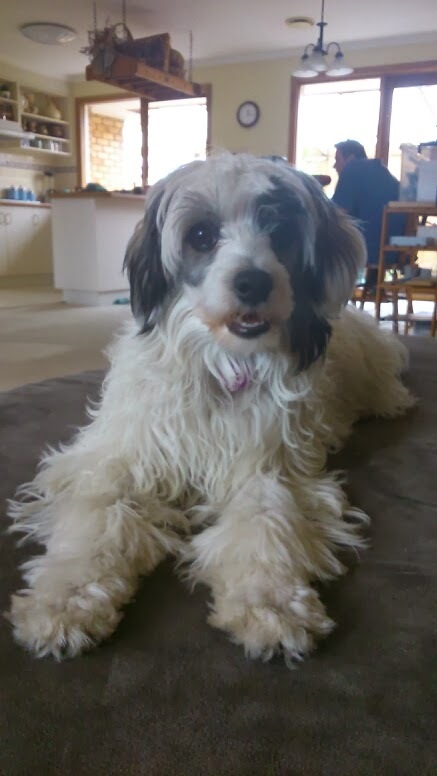 Though still a "Toy Dog" at 4.5kgs, she is very long limbed and keeps us thoroughly amused with her antics. She's part cat, part dog, part jumping hyena, part Scooby Doo (she talks). Her hair is so so soft and underneath all that hair is very fine boned and is pink with black spots. Do you remember her parents - Check This Out Pretty amazing Huh? My Bestie's delivery from her party was today and she ended up with $638 worth of product for a total of $90. Now i think that's a Win Win Win. We have been going through all her bags and boxes this evening and its been like Christmas. So much cool stuff. I also received my purchases from her party and so I'm looking forward to having a play. 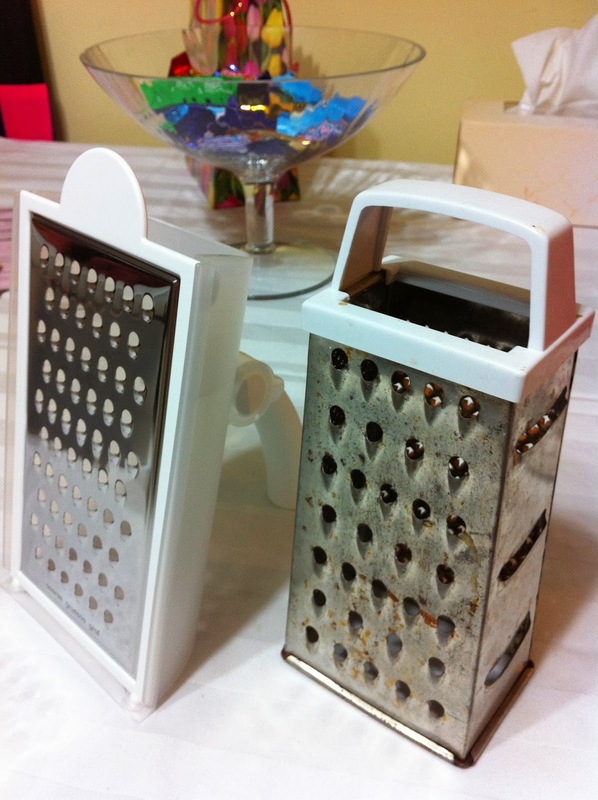 Now tell me which grater you would rather use? The new Tupperware one is like a mug with a handle. The grated whatever falls into the middle and you just tip it out. The front also comes off for cleaning. I Got One (Yeah!!!) 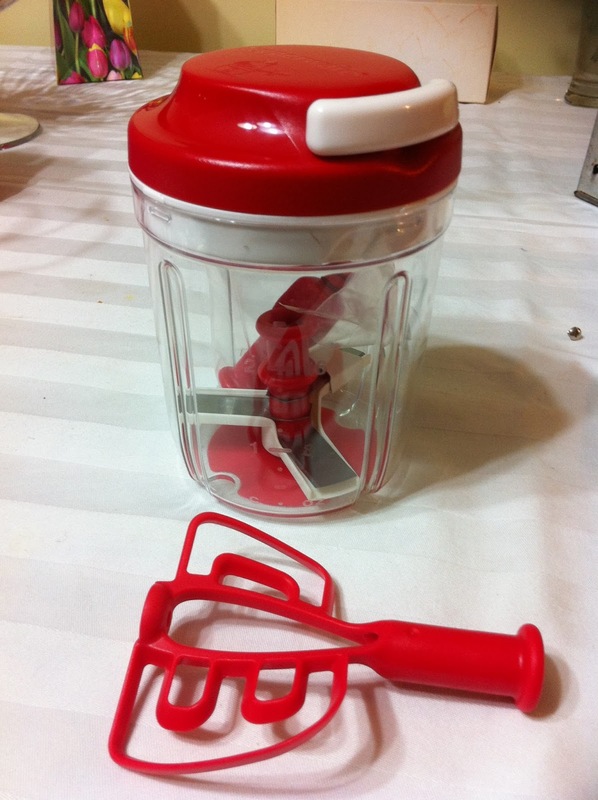 - This Smooth Chopper can whip a small bottle of cream in 30seconds. I'm looking forward to making small quantities of flavoured yogurt by simply adding fruit to natural yogurt. Just pull the cord and you get 288 knife cuts in 15 seconds. It chops, blends and whisks. 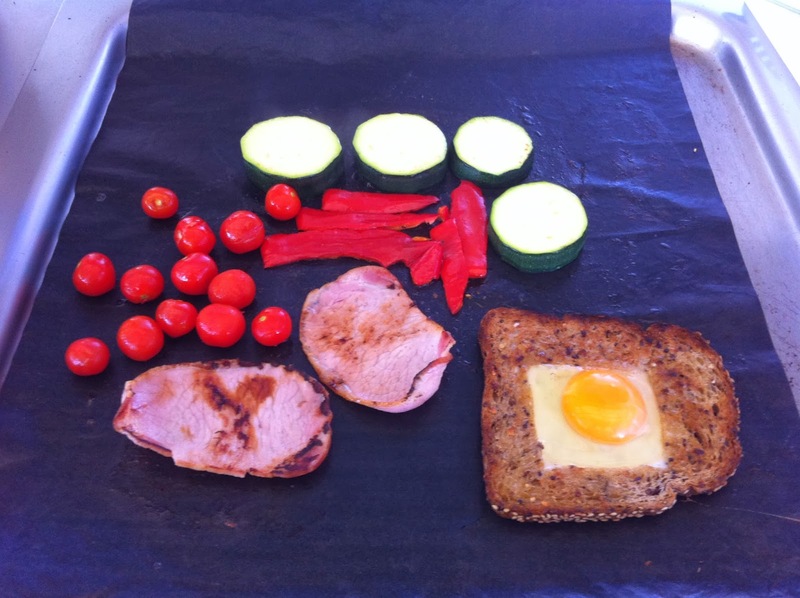 Omelettes or pancake mixes in minutes. I would really like its big brother but it was out of my price range. 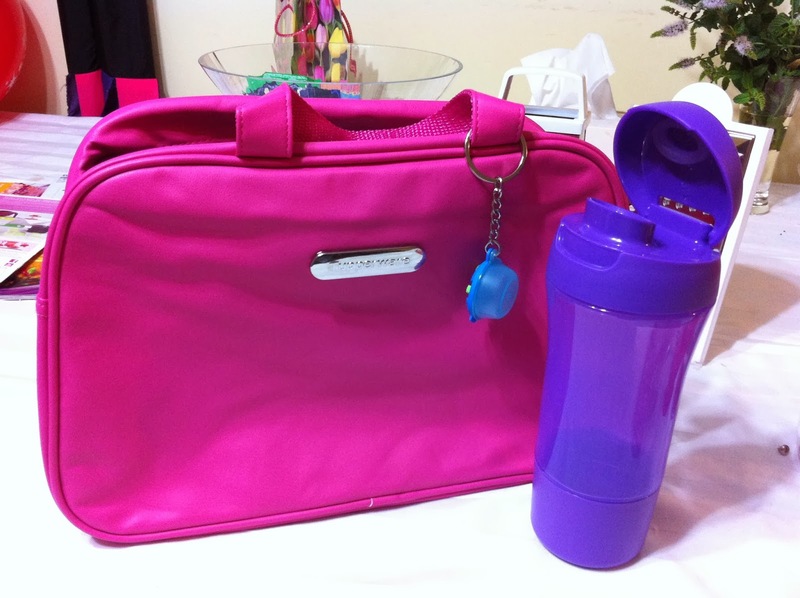 This is a thermo bag for taking lunches to work. It is quite roomy inside and will fit stacks in it. The bottom of this drink flasks comes off and can be frozen to keep drinks cool. So thanks to all my guests who attended and brought their best selves. Thanks also to my big sis for helping to cleanup. Bonza Broad! 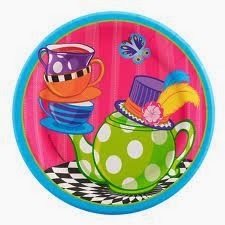 It was so great to see everyone and I love entertaining so all is right with the world tonight. Time for a big snooze. Add On - Next Day - Check out my berry icecream made in the thingy above. 1 Minute. 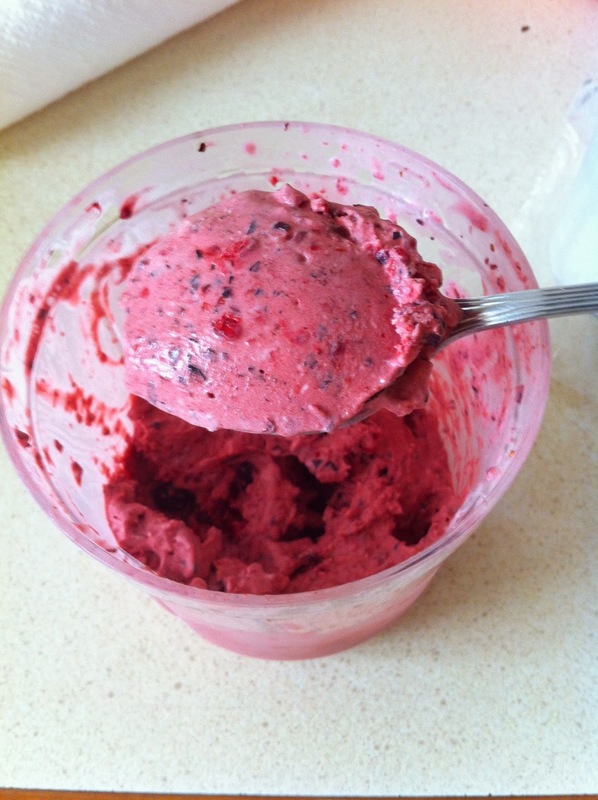 150ml thickened cream, 1 teaspoon or caster sugar and enough frozen berries to take it to the death zone at 300ml. Anything above the line may ooze up and out while processing (pulling the cord). Its thick enough to eat straight away but since im only playing with my new toy, so ive frozen it for later. Now what else can i make........ hmmmmm. Each Friday at work, i have this thing where i answer the phone and if i can identify the person i say "Hello (First Name), Happy Friday!" I try always to sound bright and cheerful. Sound strange? Perhaps it is but 9 times out of 10, despite most callers being male and usually very busy with their business, they laugh and for that moment in time, i have brought them joy. Its so naff that it shocks them. Even the grumpiest or busiest of callers, and i do get a few, do not fail to completely change their tone and respond in kind, often laughing. You would have to have a serious case of the grumps to be nasty to someone who is cheerful. Ive even started getting a few callers who jump in first and its me who laughs at how ridiculous it sounds. Although not intentional this method of greeting has broken so many barriers that next time they call i am usually on a first name basis and i can extend to asking "how are you today X". Sorry to say ladies, men do like to talk, just not to their wives/partners. Perhaps its because I'm on the end of a phone, i listen and they have never met me but i usually get a few minutes of chat before i pass calls on. You'd be surprised how often this small effort to brighten someones day translates into sales or an extension of credit. Despite wearing many hats at work, i think that the most important one is being the voice of the company. So that voice had better be pleasant and uplifting. Most people are happy that the weekend is about to arrive and that Friday is usually the end of a long work week. I'm lucky that i love my job and the people i work for and so i can afford to spread a little cheer. Try saying something nice to the courier that drops off your parcels. He's been working hard too and maybe he needs a lift. 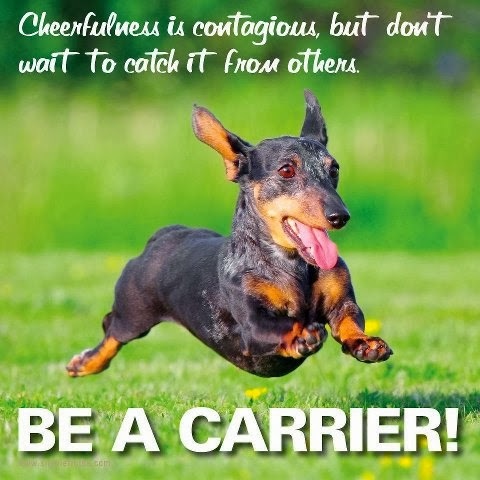 He will remember you, guaranteed, and those parcels will find there way to you with a smile. When the checkout chick asked you by rote how your day has been because they have too, bounce it back and say "Great (even if it hasn't), how are you?" I love that ring, or i like your hair today. Take the time to stop and check out the most recent photos of a staff members children. 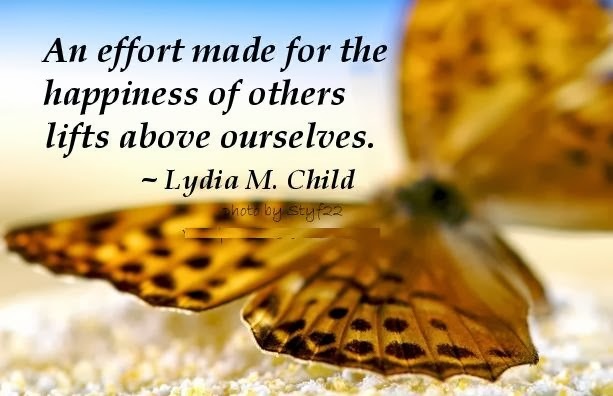 Compliment a child for behaving well in front of their parents and watch the proud glow appear on their face. Yep, I'm one of those people who can have complete conversations with people they don't know, anywhere, anytime. I'm blogging to you aren't i? I'm not always happy and full of joy. My life is sometimes very challenging but mostly i can push myself past it and you know what? I usually find that after a bit of faking, my mood lightens and it becomes genuine. It takes more effort to frown and to be grumpy than it does to smile. Its a bit like laughter therapy. Just start laughing. It will sound fake at first but shortly it catches and you are laughing for real. If you are with a friend then you will soon find yourself splitting your sides as you keep on laughing together. Its hard to stop. Usually its a case of whose pelvic floor muscles give out and its a fight to get to the toilet first. Did you know that there are over 6000 Laughter clubs in 70 countries that practise Laughter Yoga. Laughter Exercises Go on try it. If you have no one with you, laugh along with the YouTube. Careful though, this also works in reverse. I'm a sympathy crier as well. If someone is sad then i can be in tears in minutes, even if its a TV ad. I have literally burst into tears watching someone say goodbye at the airport and i didn't even know them. Don't get me started on sad movies or sob stories on the radio. Ive left home perfectly fine and been wasted with tears before reaching work. Its alright, they know me by now and take the good with the bad. There is a song out at the moment and i know its a favourite of Narf77 and many others. It makes me want to get up and dance from the first few bars. Pharrell Williams - Happy Over 63 Million views in a few months, lots of people are happy!!!!!! OK, i think you got the message. Id rather be physically ill than emotionally sad. 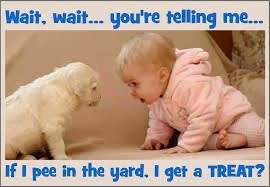 So laugh it up people, forget all the doom and gloom on the media and bring a little cheer to the world. Gardening in the Heat, Again. During my recent break (see previous post) The Boys faithfully watered the garden. It was extremely hot and so i am thankful not to return to a burnt out tangle of veggies. In fact, i returned to abundance not only of veggies but also the grass. We had to mow it several times. I spread the clippings out to dry and this morning i covered up the newly weeded beds with the dried grass to keep the moisture in. 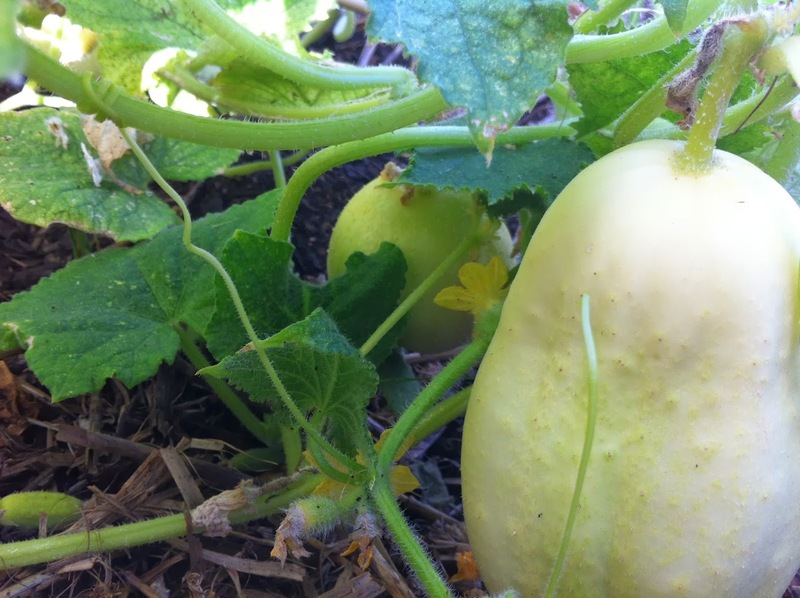 The one thing they did forget to do was harvest and so i arrived home to many giant zucchinis, stacks of lettuce on the brink of going to seed and yummy tomatoes. What i am finding in this heat is that the sun seems to burn my skin on contact. I have red hair and fair skin and it almost hurts to be out in it. Sunscreen does nothing for me. The UV must be particularly high. Apple Cucumbers - i remember coming home from school and having these with a sprinkle of salt for a snack. I haven't been successful with Lebanese or Continental and I'm waiting for a break in the heat to plant my seedlings for another attempt. My neighbours benefited from this pile. I have new renters in the place next door. 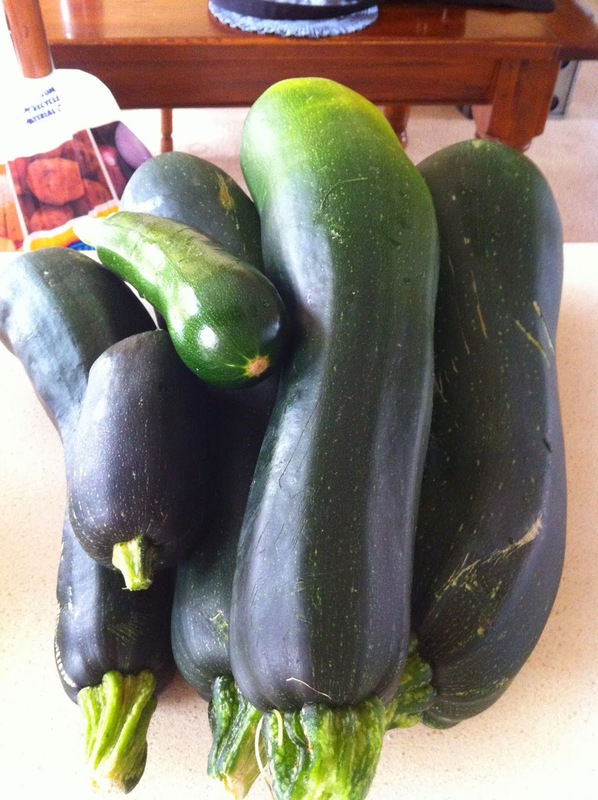 They moved in while i was away and so my first introduction was to stand on their doorstep and say "Hi, I'm Lynda from next door, please take some zucchinis off my hands.". 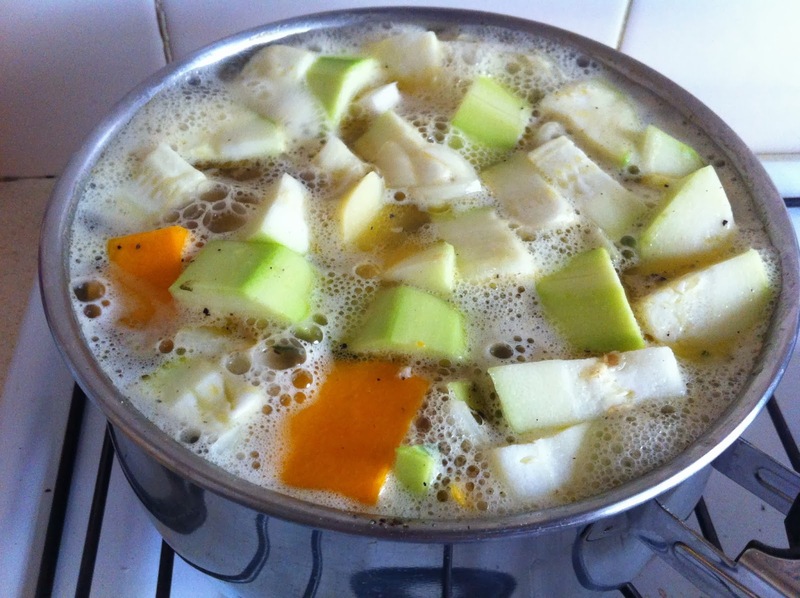 One way I've used them up is to throw a heap into a pot of homemade stock with pumpkin and potato. Though Hubby did say that it tasted slightly different from my normal soup i told him it was the coconut cream i added rather than normal cream. When my Irish camping neighbours left they for some reason didn't want to take any food home (dont know why as they only live 5 minutes from me and so it was only an hour away). I scored 16 eggs (huh, like they were going to go off in an hour). Australian Farmers Direct delivered only a few days before i arrived home another dozen. 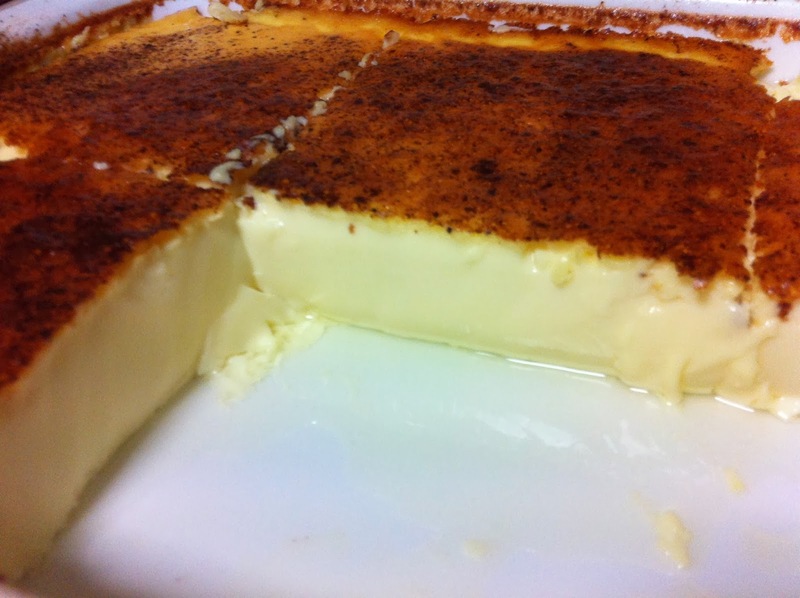 Cant believe it but this was my first baked custard. It was very simple and used up 6 of my egg glut. I think i would have like to jazz it up for make it into bread and butter pudding but my Hubby has fond memories of the slabs of baked custard they served for school lunches back in Yorkshire when he was young and i was trying to be faithful to his memories. Tom's tutor arrived for a lesson and was served the above soup and custard while she went through his spelling. She needs a little fattening up. As usual, she also left with more zukes. 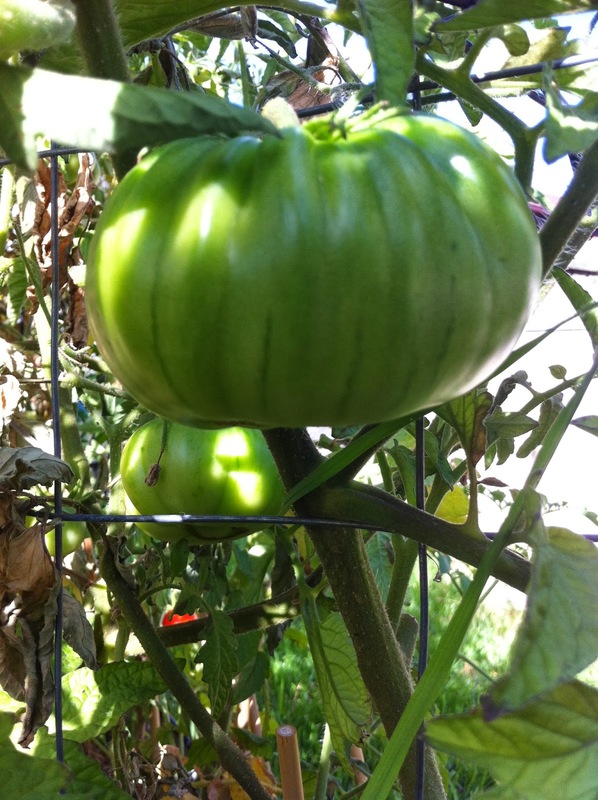 I have some massive beefeater tomatoes coming on at the moment. One thing i have noticed is that if the tomato plant is struggling it kills off the shade leaves first before the fruiting ones. I did have some fried leaves but once i removed them all i noted that what was left was some healthy stems and the fruiting leaves. Amazing huh, how it protects itself. 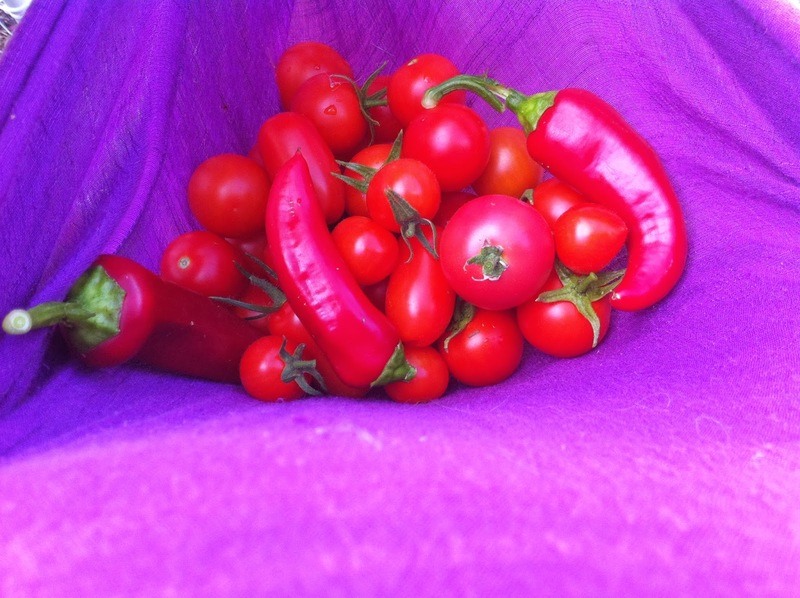 I always seem to harvest when i don't have a container and so i do what my mother did. She used her apron and i use the front of my shirt. Got to love the purple/pink and red contrast. Some of that excess lettuce, eggs and the above tomatoes became tonight's dinner. 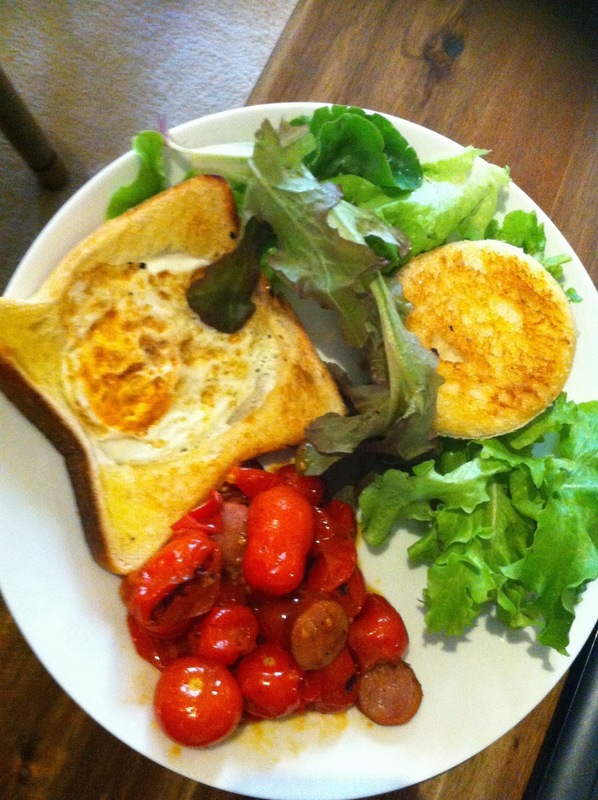 I mixed a left over piece of kabana when i cooked the tomatoes and the hole from the egg-in- bread became a giant crouton. 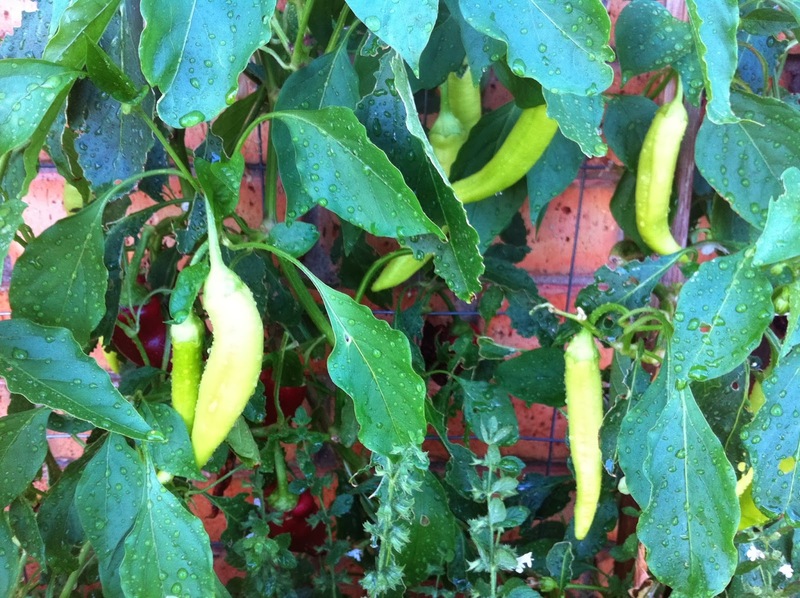 The capsicum plant seems to love the heat. 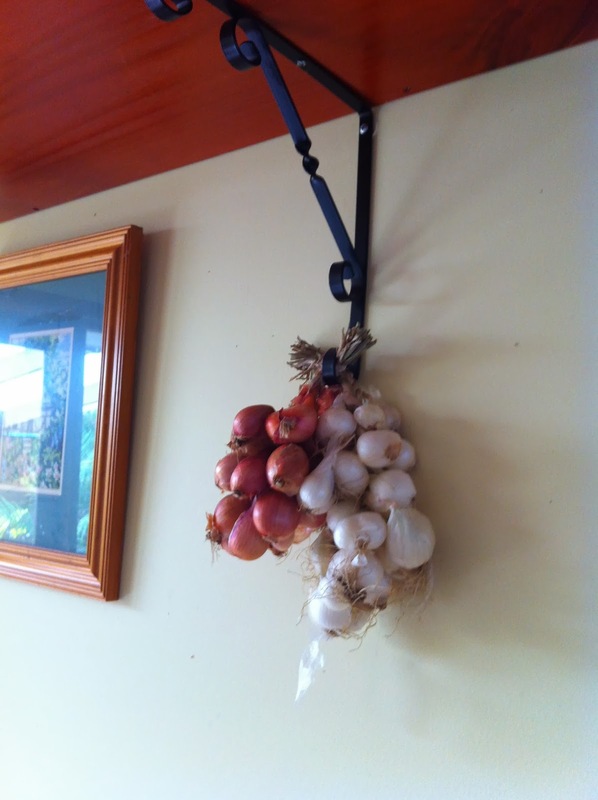 My latest piece of decor - onions from Jessie waiting to be planted. My sister stayed over last night and being both early rises and expecting another hot day, we got out into the garden to do some overdue weeding. The corn was finished and i stupidly realised that the beans i planted at the base of them were not going to climb up. They were dwarf beans. DOH! I'm wondering why she couldn't see that there were beans all over them. I mentioned that the now finished corn needed to come out. Shock horror to find that not being a gardener the beans were considered weeds and pulled out as well. She seems to love clearing the beds and having bare soil on display. All neat and tidy. I rescued some rogue free tomatoes that were in there. I watched a little bit closer after than but i am very greatful for the help. We were drowned in sweat by 9am. Keep cool guys. There is more hot weather on the way. I'm finding that early morning watering seems to work best, though if its really a scorcher, i have lightly sprayed the back wall of trellises to take the heat out of the brick wall in the evening. I have also strung up rope between the beds and hung shadecloth (like sheets on a washing line) to filter the north west sun. The lettuce bed is also completely covered with shade cloth, which i think is 70%. Tom is currently reading out loud out of a book written in 1940. Its a series of reports and letters from the middle east at the beginning of WWII. He's just about to get to the Australian and British forces entering Tobruk so i had better go pay attention as he is finding all the detail fascinating and keeps looking over to see if I'm listening. How many feet the trenches were etc, which direction they came from (shows me the map) and on and on and on...... This 24 hr a day preoccupation with military has the house almost permanently sounding like a battlefield. Its tiring but having had my rest I'm now able to deal with this with patience and understanding. Sometimes being a good mum, means having to leave for a little while. Its been awhile since I've posted and that's mostly because I've either been working like a mad thing to get ready for a wee break or I've been away on a wee break or I've come back to a mountain of work after my wee break. A wee break, that is, lasting a total of 6 nights ON MY OWN! Egad! Is it true? Did i really go off and spend a few days away from my son and hubby leaving them alone to manage a home and little Miss Tilly on their own? Really??? Such was the reaction of several of my fellow campers who queried where my family was. Honest, I'm not sure if they were incredulous that i would do such a thing or were they just full of pure unadulterated jealously. "The Boys" (read 16 year old and 53 year old) got their usual booty of stuff for Christmas. Having no interest in getting anything, i asked for "Time for Myself". No cooking for anyone (though i do remember visitors being served meals), no housework (hmmm, i do remember a lot of setting up and homemaking going on), getting up when i wanted to (or when the neighbours children did but thankfully we were in sync and i loved their irish accents - so happy) and going to bed whenever i wanted including Nana naps. Sound Good? Many moons ago in the last century when i was but a lass i did my time of camping on riverbanks, squatting behind trees and being semi-dirty all day. Well guess what? At almost 50 (getting closer by the minute) i don't have to do that anymore. But what i do have is a limited budget. 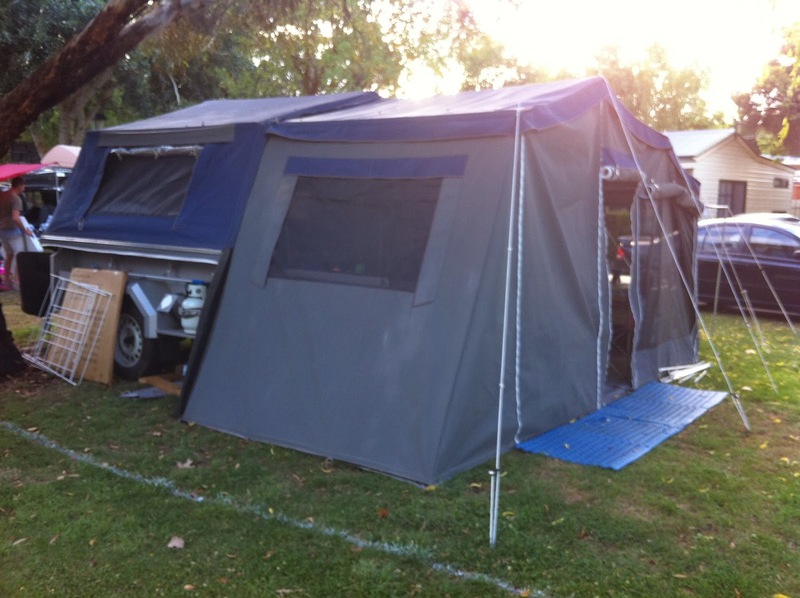 Thankfully about 5 years ago after a very expensive holiday staying in an apartment in Qld we bought a camper trailer. It hasn't been used a great deal but my total holiday cost for the 6 days was less than $250 and to me that's a budget holiday. As you will see i didn't go without. Another cost saving was that my employer when hearing that i was umming and arghhing about going due to finances, threw me a fuel card to be used by myself and the boys running backwards and forward. This really was helpful and a great saving. Ballarat is 1 hr from home making it quick to get to and quick for visitors as well. This place is so amazing and provides such great service that it is the 4th time I've stayed here. Once you enter the gates you could be anywhere in Oz. The temperature was between 27-40 during the day and at night 12 - 20. 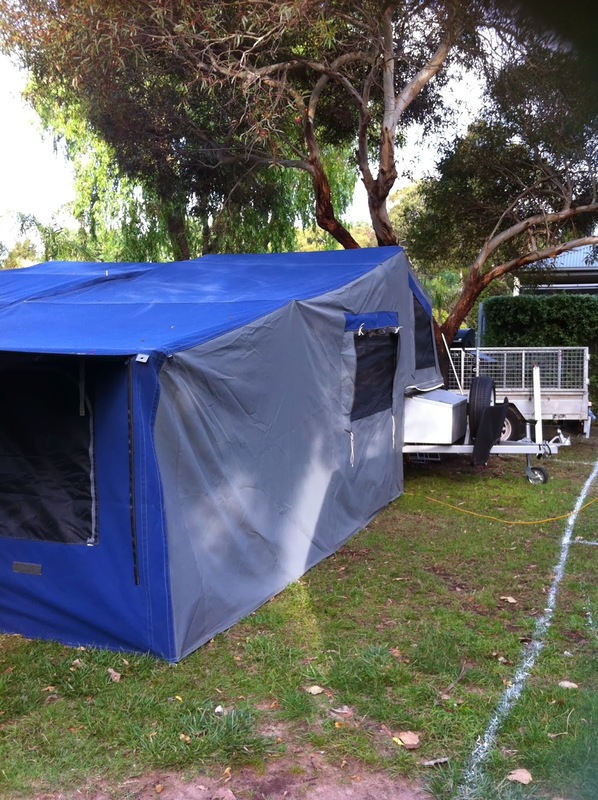 A bit hot some days and I've since raised my right hand to Hubby and solemnly sworn that i will choose another time of the year to erect the camper trailer other than Mid Summer. 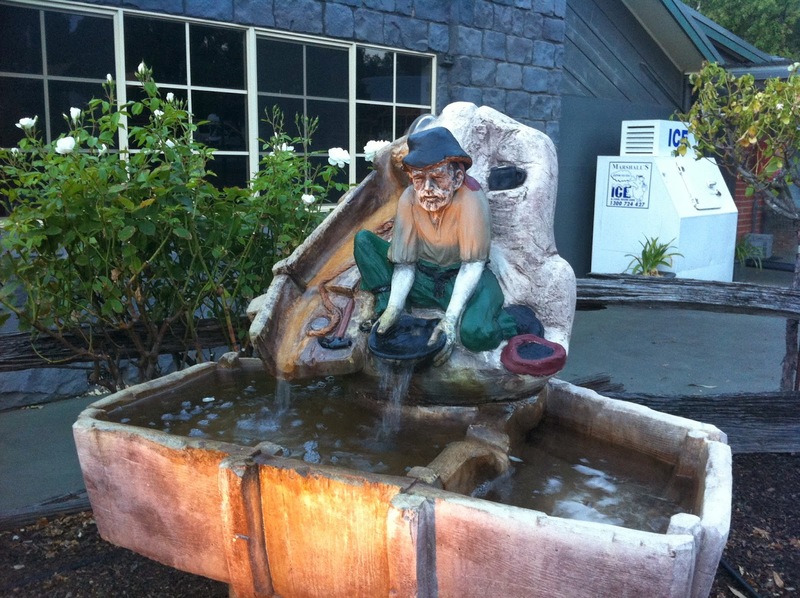 Goldfields is only about 800m from Sovereign Hill, one of the states leading tourist attractions. 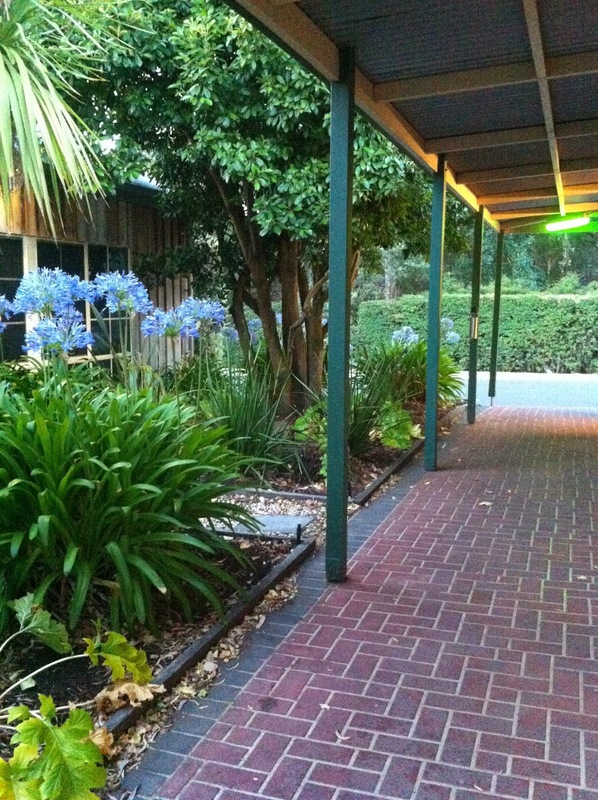 Many of the guests of Goldfields make their way there and so there is actually a back entrance leading to a walking path straight there. At night you can hear the sound effects from Blood On The Southern Cross. Its truly worth seeing. 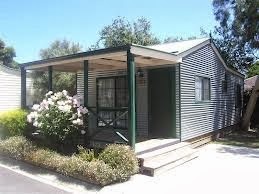 Most people stay in these air conditioned little cottages or turn up in caravans and motor homes. 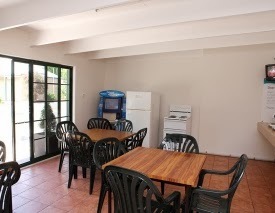 Its known as a miners cottage and comes with one, two or three bedrooms. See the garden in front. The entire site is covered in lavender bushes, standard iceberg roses and various natives. Its like living in a garden. 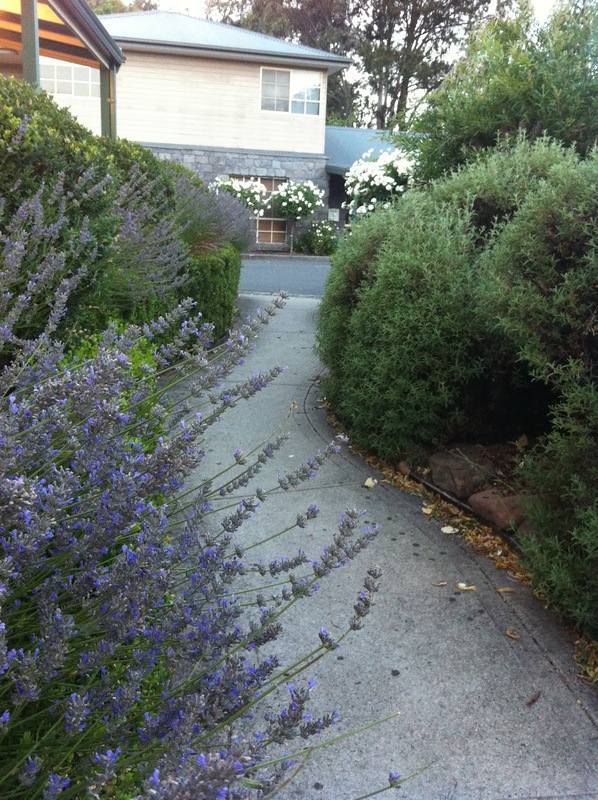 This walkway was full of bees, which didn't stop me running my hands over the lavender to release the scent. The amenities block which is spotlessly clean. I didn't think i should take photos inside, that would be a bit weird. Anyone for a dip in the pool? On Tuesday 28th Jan, everyone left (to head back to school) and so i actually ventured into the pool and outdoor spa. I did warn the owners they'd have to top the water up when i left. This is actually quite warm and is lovely in the evening. 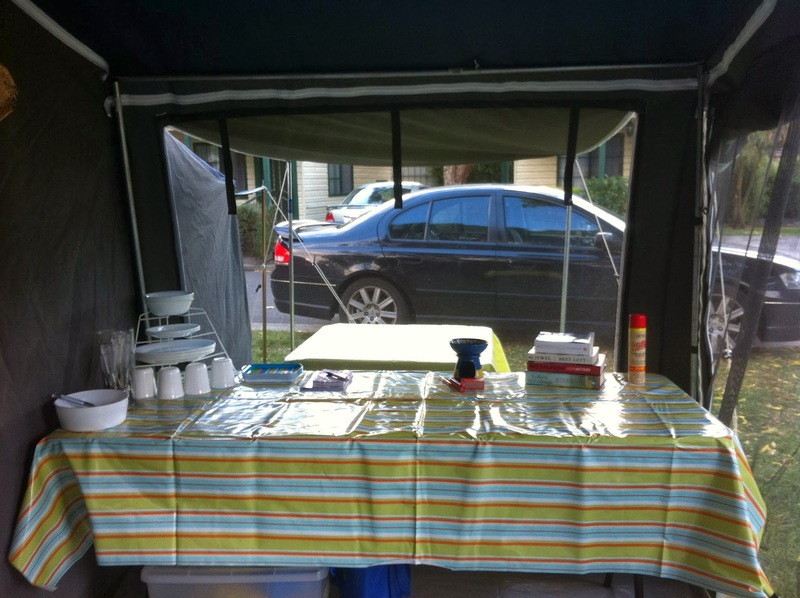 Its for private hire - for $10 you get it all to yourself for 30 minutes. Its also a swim spa so if you can be bothered you can turn up the jets and go for a swim. 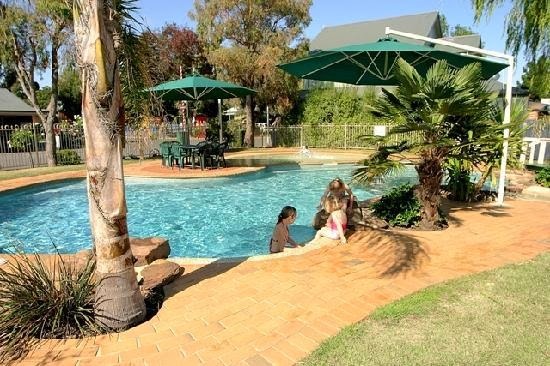 The site that i always get is not in the main camping area but off behind the pool where there is just 3 sites and the rest is a lawn area with a BBQ kitchen and tables. It has 2 BBQs used mostly by the surrounding cabins and a sink with hot water. My site is the closest and faces directly onto it and as such its like having my own kitchen. These BBQ's are cleaned till they gleam twice a day. 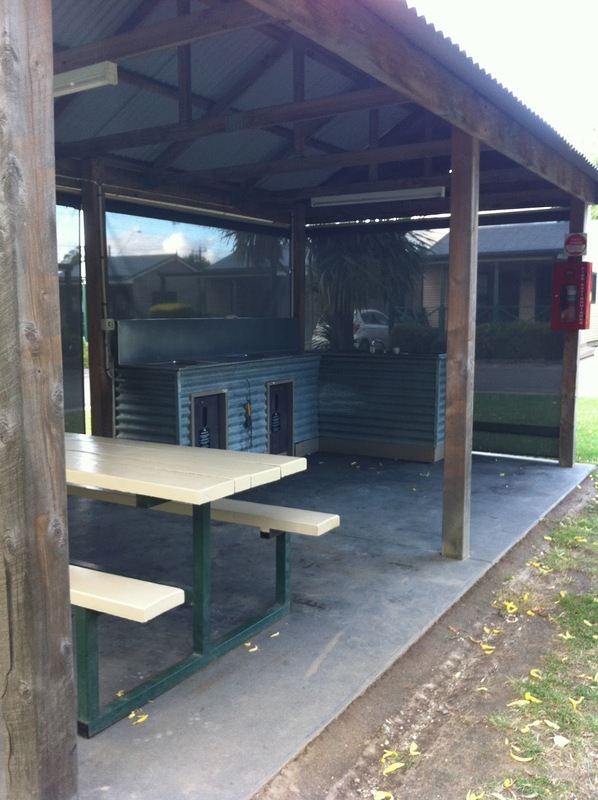 I cant believe the number of people who turn up to cook their meat and just walk away leaving it a disgusting mess for the next person. If i could see pending doom, marinated meat, i race out and offer them my BBQ mat. I wouldn't be without one of these and many never having seen them before, get one the next day. I could have sold dozens of them. Not that i need another kitchen as i have my own in the annexe. 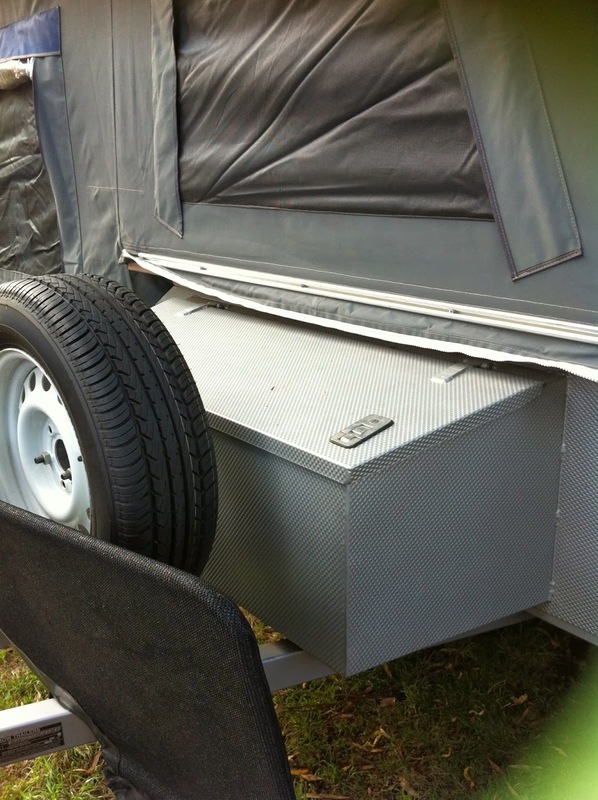 I have 3 gas hobs, sink and a 60L tank of water under the trailer. On the bottom right you can just see my bar fridge which was full of all things girls love like salad, fruit, yogurt, juice, & chocolate. 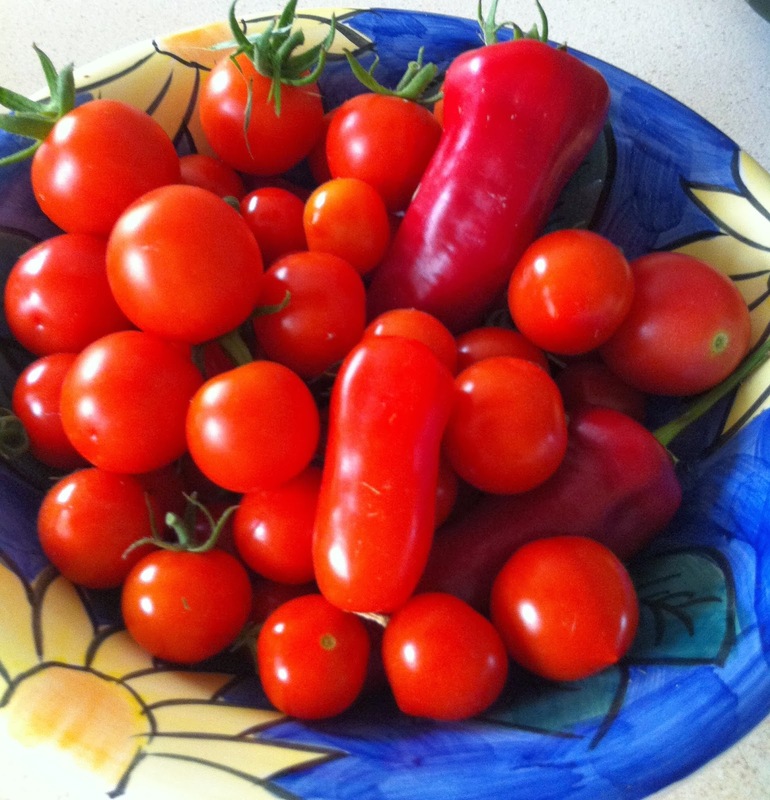 I had brought lots of things from my garden at home so i was having grilled zucchini and tomatoes instead of meat. Both are lovely with balsamic vinegar sprinkled on them. 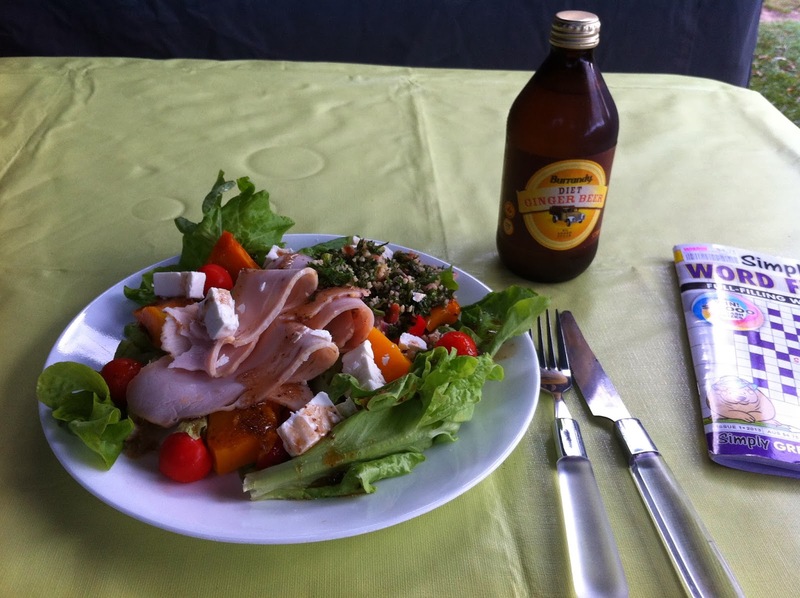 I didnt have to share my diet ginger beer with anyone. Yeah !!! See, no messy BBQ. I even got to have bread with seeds in it - not Tom's slimy white slice. See how i cut a square out of the bread to hold my egg and stop it running everywhere. 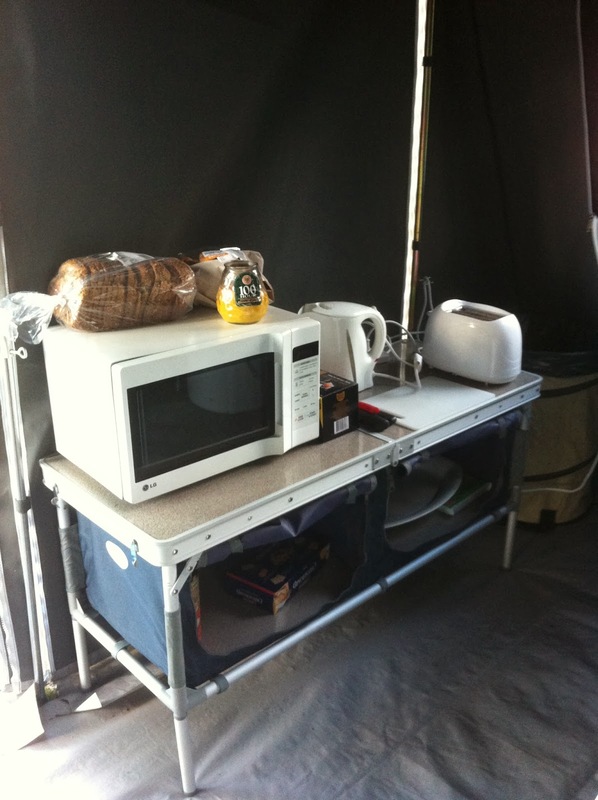 Those that don't come with a built in kitchen can also use the central camp kitchen which has everything you could ask for. 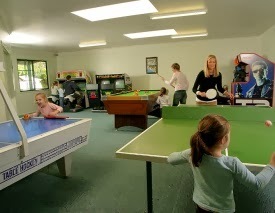 Fridge, freezer, ovens, microwave, indoor and outdoor dining tables, washing up area, cold drinks and chocolate vending machines, several bbqs, Internet cafe and just for fun a giant outdoor chess game. They also run the kids club from here, either in or our depending on the weather. I didn't need to use it but the laundry proves to be a meeting place for the ladies in the evening. So what does the rest of our camper look like? The other end of the annexe - crockery and cutlery set, oil burner with lovely smelling melts from Kim, pile of novels and puzzle books. The windows can either be turned into verandas or rolled up. 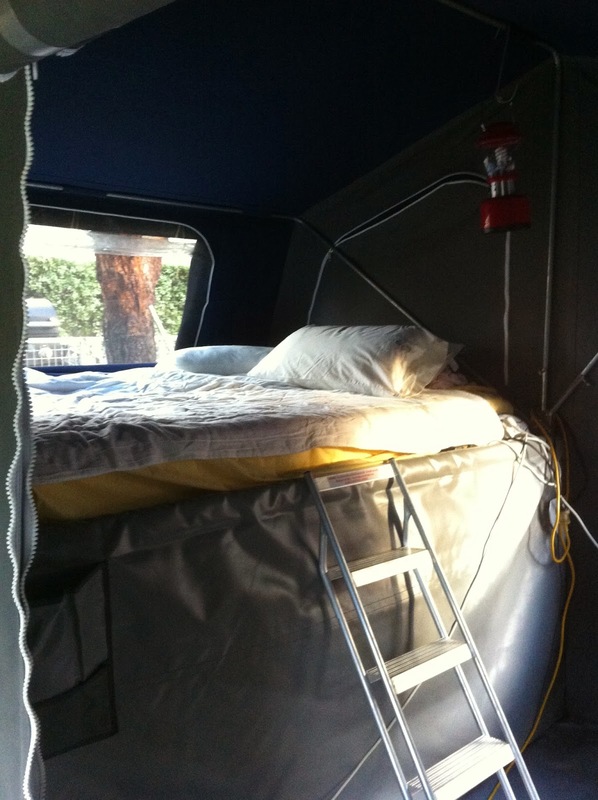 Up on top of the trailer inside is a queen inner spring mattress. We quickly got rid of the thin rubber one that came with the trailer. 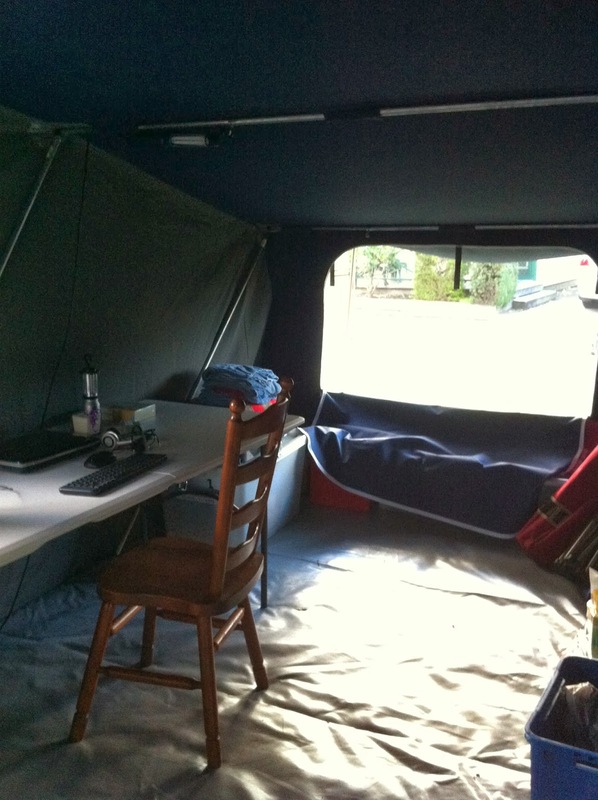 Normally at this end of the tent there is a self blow up queen mattress but with no one along for the ride i was able to set up another full length trestle table and have my laptop set up and also a fan to move the air around. I hate having the tent messy so i always straighten up each day. Clothes are hung on hanger on the cross bars half way down. I have a number of S Bend hooks so the floor is kept clear by handing everything up. Good thing too because with the number of people who want the grand tour i wouldn't want my Reg Grundies laying around. So apart from reading, what else did i get up to? Both Jessie and Kim told me i had really missed out not watching Downton Abbey. So for Christmas i bought with a gift card the boxed set of the first 3 series. This is what i did at night when all was quiet. Not to worry the neighbours, i had headphones. I did get carried away abit and a couple of nights i was going to bed in the morning. 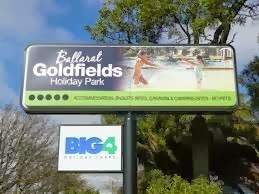 This seems to have turned intoan advertisement for Ballarat Goldfields and for Arrow Campertrailers so i had better show you the outside. This is not your Rays Tent City variety of trailer. The canvas is extra heavy duty and the zips are massive. On my first night it poured and with the rain only a few feet above my head it sounded amazing. Its tied down so well it would stand the strongest winds. Once i zip it up at night it is completely bug free though i was burning lovely orange scented citronella candles. The floor is part of the tent and so there are no gaps around the edges. How well you can put this up depends on your site. There is a slight slope on this one and so we couldn't get it completely tight. It didn't bother me but it sure bothered Hubby. Being Ballarat there are also lots of buried rocks and so putting the pegs in (lots) takes time and grunt work. This is a keyed lockup for valuables. Ok, now the bad news. The main tent off the trailer could be up and plugged in and pegged down in an hour. Add the annexe and all the extras (which is optional) and its probably a 3 hr job. We don't use this for anything less than a week. Due to hot weather (and pleas from The Boys) i came home a few days early. This is why I've had to swear i wont do this again in mid summer. It is tough job and the canvas is heavy to fold. I got extremely burnt putting it up and Hubby got very hot as well (in other ways). Last time i was here, Hubby was working and i busted a knee the day before. When i arrived, they took my car, while i hobbled on crutches to the site, and put it up for me. I gave them the normal Oz currency of a slab and we were all happy. The good news is that everything that you saw in the tent above gets cleaned, boxed up and put in the trailer for next time. There is a kitchen box, a microwave box, laundry and cleaning, toiletries and first aid. 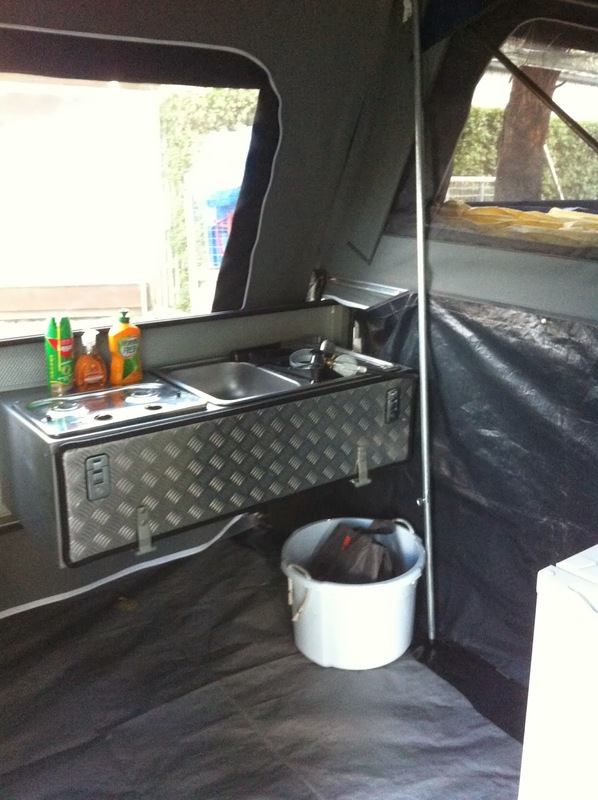 The tables, clothes horse, mats, camp chairs, ladder, and annexe pieces also go into the trailer along with the fold in kitchen. 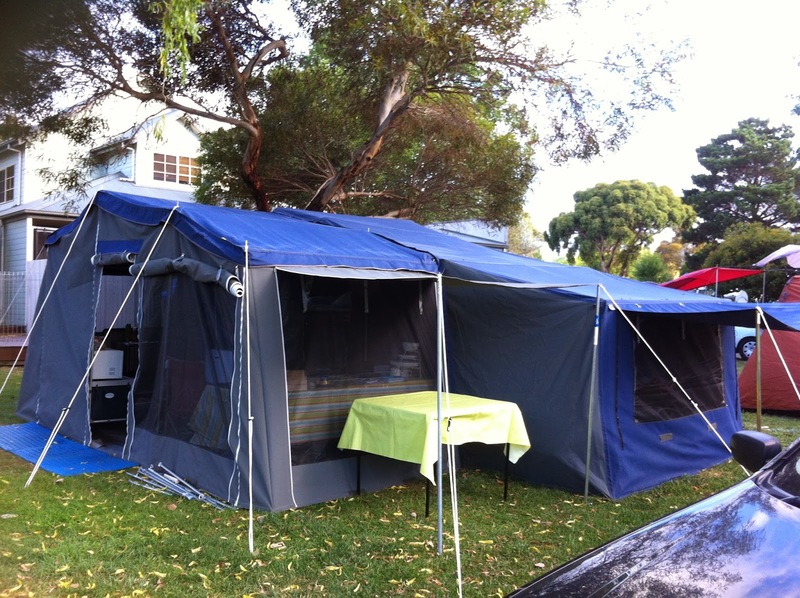 The main tent folds up like a concertina and packs flat so that it can be towed at normal speed. Everything is covered by a thick sealed zipped cover until it reaches our hard stand area in the front yard and there it is covered yet again. All ready for next time. Nothing gets taken out. Clothes and food, go in the boot of the car so it takes very little time on the home front. So what is there for kids to do other than the pool? I received a lovely visit from Jessie from rabidlittlehippy and her 3 munchkins. 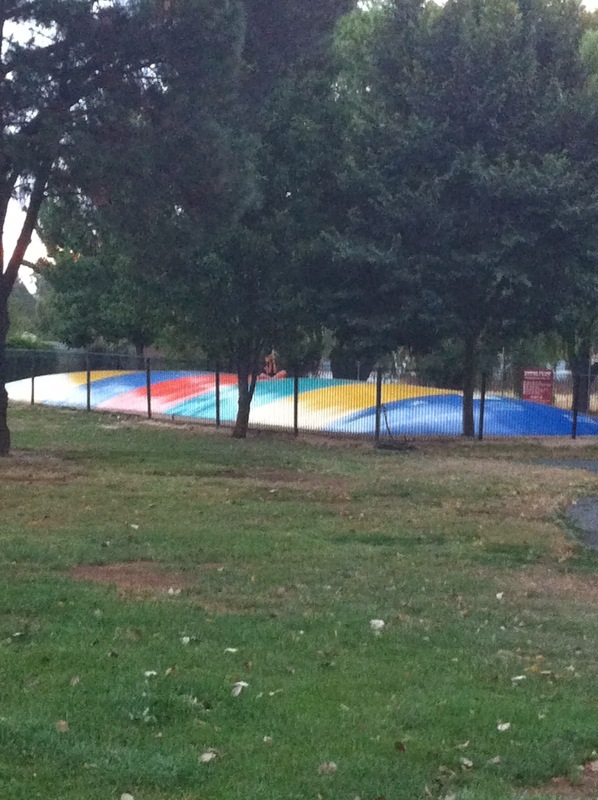 First it was onto the jumping pillow but they were really more interested in the soft sand that surrounds it. 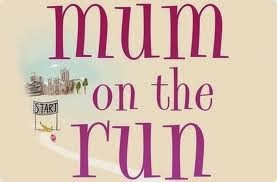 Jessie did look a scream jumping from one end to the other until her pelvic floor gave out. 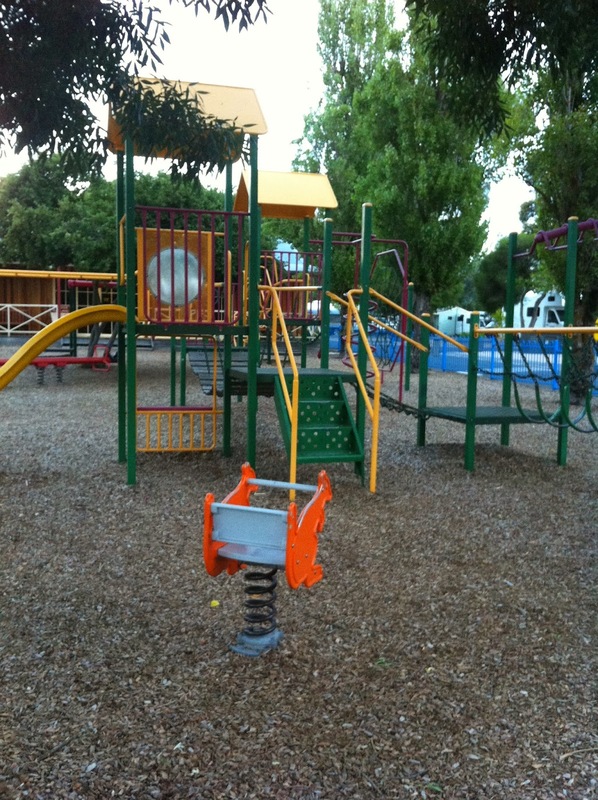 At the far end of this enclosed playground is an air conditioned play room with indoor play equipment. 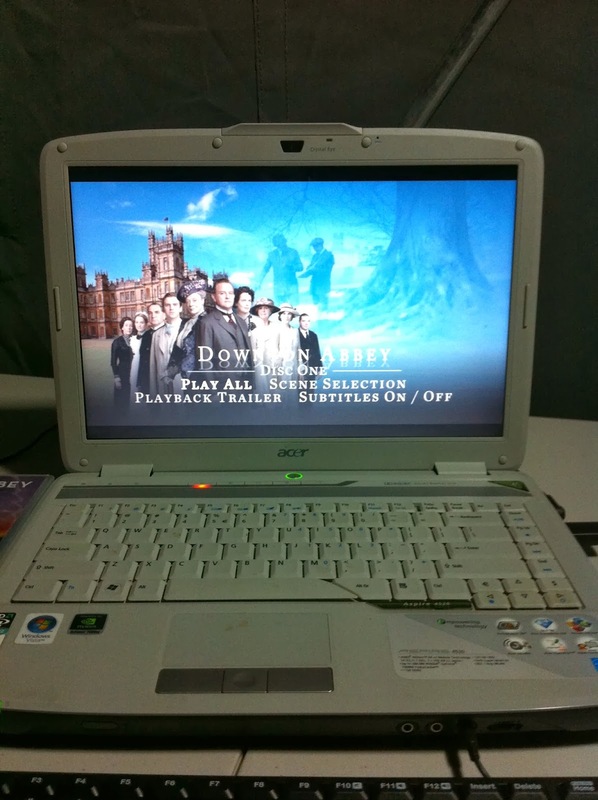 This is reserved for 0-5yrs but during holidays they also screen movies at various times. 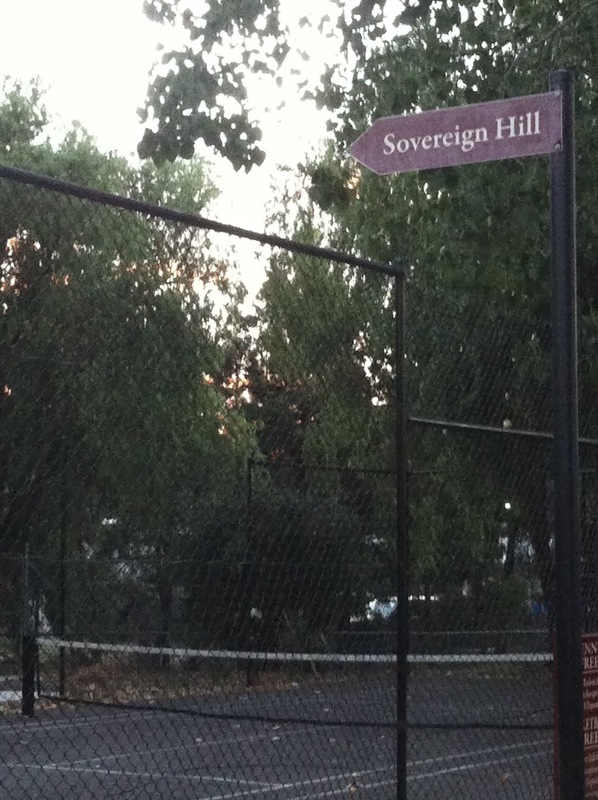 There is also a half size tennis court and next to it a basketball hoop for shots. Tom and i spent some time in here playing pool very badly when they visited. The best thing about staying here is the people. 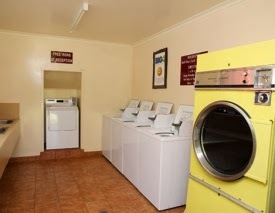 It is not only the owners and staff that are friendly and helpful but also the guests. I don't know why but I've never had on any of my visits a rowdy crowd or groups of people who cause trouble. Its such a family place. I had a group of Irish families next to me for several days and they soon invited me into their midst for meals and singalongs. I love that at night the men sing ballads along with the women. Their accents were hilarious. At night there was a Dad in each tent that snored. They were going in tandem until i started to hear an equally disturbing noise in the tree above my head. It was loud and kind of a strangled sound but in rhythm with the boys. I rushed out in the morning saying "It wasn't me" thinking that they would think it was me snoring but i told them it was the possums. Not sleeping (Doh!) but having relations, above my head. I was also adopted by a lovely Macedonia older women who told me "i was a lovely lady" and kept pushing her newly divorced son at me. I kept saying, my husband this, my husband that... it was a bit funny. When they left they loaded me up with enough meat and veggies that i phoned the boys to come down for BBQ lunch the next day. At night, it is the done thing to promenade along the roads around the park. Everyone is on the move, stopping by, commenting on this and that, asking to have a look inside, or chatting about their journeys. Some of the big Winnebagos are amazing inside. When my Bestie came to visit, we walked 15 laps of the park without even a rest. And so that's it. I went back to work for 2 days to do month end and then completed my wee break this week with another 3 days of reading and catching up on appointments for the family. All ready for the next year ahead. Have you ever holidayed alone away from the family? Tip for next time - leave the mobile at home.